This book is a peer-reviewed sport psychology text designed to help individuals enhance mental functioning to skyrocket performance and health. Whether you are an athlete, coach, exerciser, or just looking for ways to excel in another area of life, this book offers a clear pathway to optimize your mental game and become a champion in all walks of life. Both practical and palatable, this book is an essential part of your training arsenal to reach your potential and beyond. The Author's Blog is Here. Newspaper covers our author! If you are a professor or instructor interested in using this title in your course, please fill out our desk copy request form and we will review your request. 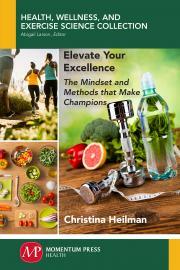 Christina Heilman, PhD, ATC, CSCS, is a coach, author, researcher, and speaker in the applied field of mental excellence. She is the founder of Mindset and has worked closely with hundreds of leaders, coaches, and youth, recreational, collegiate, and professional athletes, helping them achieve healthy, long-lasting habits to optimize their performance without destroying their health and well-being in the process.